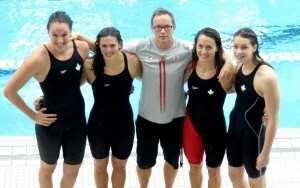 Sydney Pickrem and Sarah Darcel, both representing Island Swimming, have each scratched out of an A-final tonight at the Canadian Swimming Trials. Pickrem is out of the 200 back after posting the 5th best morning time of 2:12.39, while Darcel has scratched the 100 fly where she was heading into the final 7th at 1:01.03. Both were major players in the 400 IM final last night, as Pickrem booked her ticket to Budapest with the victory in a best time of 4:35.43. Darcel led that race at the halfway mark, but was passed on the final 50 by Mary-Sophie Harvey and ultimately finished 3rd. Though missing a spot on the team, she was well under the World Championship qualifying time in a best of 4:39.29. The scratches aren’t surprising, as neither of these are their primary event. Both will contest the 200 IM tomorrow, where they’re both in the hunt for a spot, and Darcel is also entered in the 200 fly. Pickrem is the Canadian record holder in the 200 IM, despite being seeded 5th for this meet, while Darcel is the 4th seed at 2:13.40, which is actually 0.01 under the qualifying standard. Darcel’s 200 fly seed is also high at 5th, but her time of 2:14.12 is over four seconds off the standard in that event. Because of the scratches Hannah Genich moves into the 100 fly A-final, while Genevieve Cantin gains a spot in the 200 back A-final. Also scratching the 200 back was Taylor Ruck and Kayla Sanchez, who are now out of the B-final. The other scratch for finals tonight was Sarah Fournier, who is out of the women’s 50 breast B-final.